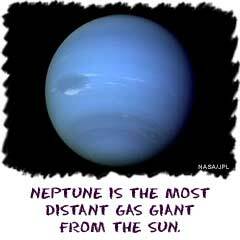 Neptune is the eighth planet form the Sun. It wasn't discovered until 1846. It wasn't even actually seen with a telescope for several years after that. Astronomers noticed some funny movements in the orbit of Uranus. The changes in the expected orbit were so large than they decided another planet must exist. They made the calculations, looked in the right place, and found Neptune. Neptune is huge in size compared to Earth. When you compare it to the other gaseous planets like Jupiter and Saturn, it is the smallest. Like the other Jovian giants, Neptune's atmosphere is made up of hydrogen and helium. It also has large amounts of methane that give it a deep blue tint. It is very similar to Uranus. See that big swirl in the atmosphere? Just like Jupiter, Neptune has large storms swirling in its atmosphere. When Voyager II passed by, it took pictures of a storm that was big enough to hold the Earth. The storm was moving at more than 500 miles per hour. The speeds inside of the storm could have been more than seven times the speed of the fastest winds on Earth. Voyager II was the only probe that ever made it to Neptune. It was able to fly by on its way out of the Solar System. It discovered new moons around the planet, bringing the total to eight moons. Its photos also confirmed that Neptune has very thin rings around the planet.